I think we might be addicted to multi-course degustation menus. You might think this is lazy, to let the chef pick for you. 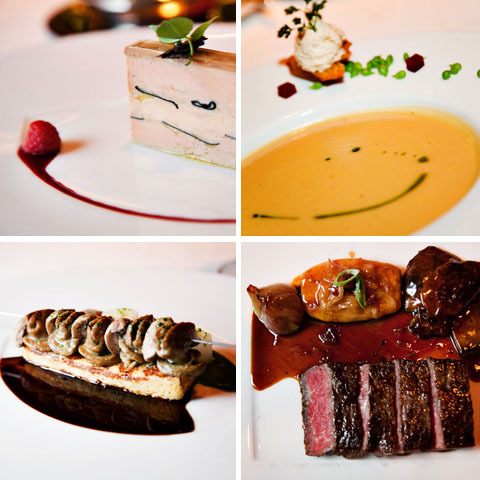 But in reality it is the diner’s best opportunity to see what the chef can really do – his highlight reel in a way. And as the keen observers of culinary trends that our readers no doubt are, you will notice this is all the rage. Maybe it has something to do with the new “rock star” or “celebrity chef” culture, maybe it is diners’ increasing demand for the best quality…whatever it is, this is what we tend to order when it is available. 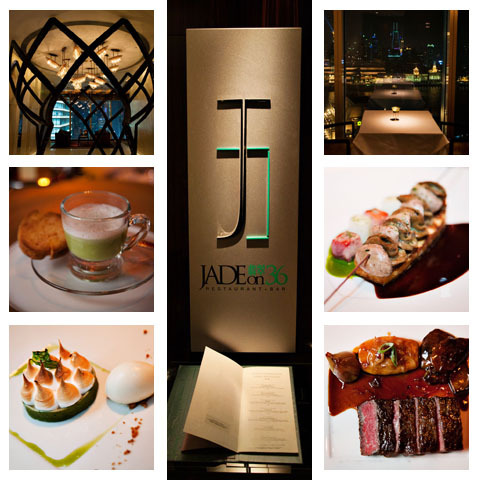 And so on a recent visit to Jade on 36 in Shanghai at the Shangri La Hotel, we decided to give their 5 course tasting menu a run through. 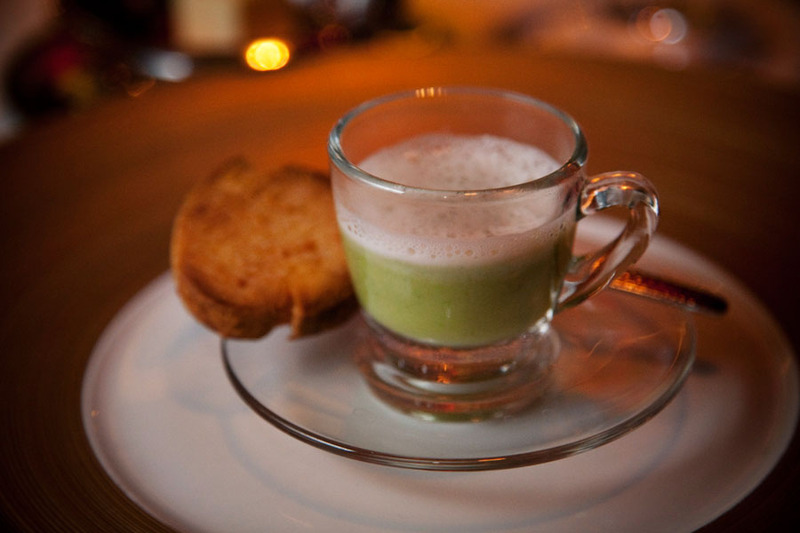 As is customary these days, we started with a surprise amuse bouche from the chef – a pea soup with coconut foam and cheese cracker. It was a classic rendition of pea soup slightly modernized. I used to be a foam cynic, thinking that they were a bit pretentious and typically superfluous, but I must admit I am coming around… the burst of coconut added an unexpected twist that was appreciated. The cheese cracker, however, was a really a taste afterthought. 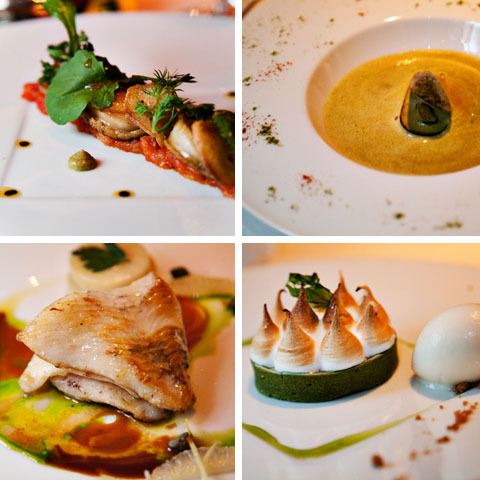 In general while both gastronomic menus read as quite innovative and tempting, I will say we were a bit let down in some cases by the execution on a few dishes. Somehow the concepts were more impressive than the actual dishes. For example, the pan fried snails and french toast which should have been an intriguing juxtaposition of flavour profiles but instead was, in a word, bland. Also the abalone which should have been a delicacy exalted to the next level, was instead rather ordinary. And while the dishes named above were somewhat disappointing, I would love to be able to tell you about the real standouts. But looking back at the meal, nothing actually does stand out. Most of the other items were executed with a certain degree of competence, but somehow lacked the depth and soul one expects of a gastronomic tasting menu. Who knows…maybe it was an off night. Certainly the service was spotty. The waiter was not terribly attentive and when he was there he seemed uncomfortable and downright anxious. In fact, he was so nervous he served my wine in my water glass – which was already full of water! In summary while I would say this is a lovely site for a meal with a view, the tasting menu simply didn’t stand up to our level of expectations. I think I would prefer to go to some old favorites like M on the Bund or Jean Georges before returning to Jade on 36 any time soon. 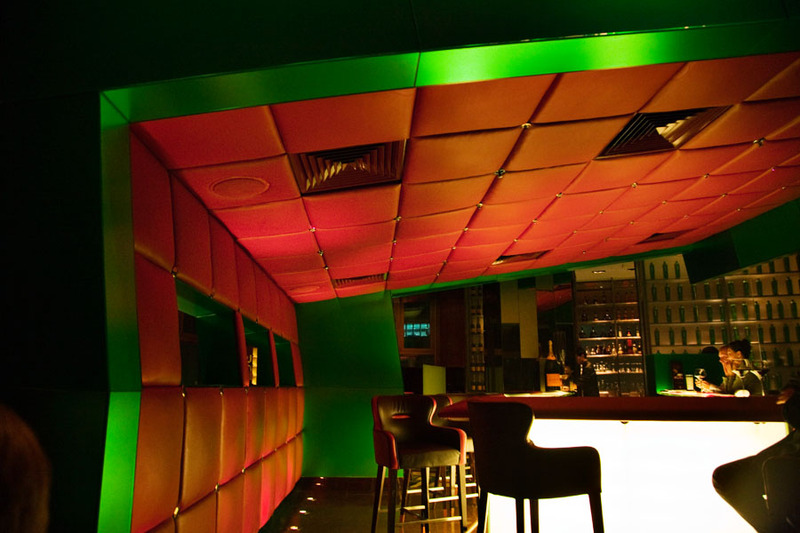 That said, the bar area provides a lovely spot to have a drink and a view of the Bund, so perhaps this is the way to go when visiting Jade on 36. This was one of the worst meals I have ever had. It was all about foam and slime, and though Heston Blumenthal can get away with his molecular gastronomy, this was just a very bad imitation. My most memorable experience was the makerel sashimi, which was served with an anchovie jelly, which all had the same texture without any flavour from the makeral. When I mentioned this to the French waiter, he condescendingly asked if I had ever had sashimi before. He was insulting and not particularly interested in any feedback. I agree that the staff were very indifferent and the overall pomp and circumstance was not just unmemorable, but inedible. I agree, go to Michele’s restaurant!